The Wellington-born batsman said that like millions around the world,he to credited Sachin Tendulkar as an inspiring force behind him picking up the willow. I came to cricket due to my father and seeing Sachin Tendulkar play. They are my vivid memories, remembered Taylor. Ross Taylor’s kiwis batsmen and Bangalore Royal Challengers aggressive and fluent hitting seems New Zealands best bet against India’s pace battery of Zaheer Khan, Ishant Sharma. During my stint with Bangalore Royal Challengers in the IPL,I enjoyed the food and hospitality. I am eagerly awaiting the second season,” said Taylor. The 25-year old is approaching the India series as one of his biggest challenges. Not only the fast bowlers, even Harbhajan Singh, with all his experience, can make all the difference.It`s a champion side we are taking on,” Taylor said on Saturday. 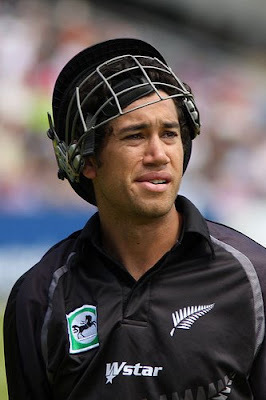 Lack of Test match experience is a matter of concern for him and his inexperienced side.He acknowledged that New Zealand were undergoing a rebuilding process under the leadership of Daniel Vettori, and was eager to don a senior batsman`s role. “We don`t have big stars in the team but Vettori ,Brendon McCullum and Jacob Oram bring enough flair and experience in the side,” explained Taylor.